Selling fish is a cutthroat business, and anyone who braves the 4am wake up call to peddle ice cold specimens of mackerel and trout deserves credit. But when the window for freshness fades, a vendor might resort to grifting his patrons to maintain a foothold in the hardscrabble business. 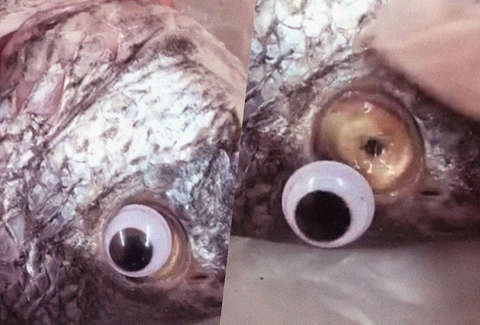 A fishmonger in Kuwait was recently shut down when it was discovered that he was using fake googly-eyes to make his stock look fresher than it actually was. It's a commendable marketing stunt in its own right, but also kinda shady! The deception was spurred by rival fish sellers competing for business, reports the BBC. To give his business an edge, one vendor resorted to artificial cosmetics, giving his fish a wide-eyed look reminiscent of Wiley Coyote. The ruse was revealed in a Facebook video, in which a customer pulls off the fake eye, revealing a yellow and sunken eye. According to ChefSteps.com, a fish's eyes "should be crystal-clear, plump, wet, and shiny, with no sunken features. If the eyes look good, you can bet with reasonable confidence that the fish is fresh and healthy." To the contrary, the fraud fish had discolored, vampiric eyes -- which aren't the hallmarks of a healthy specimen that you'd willfully eat. May your fish remain untainted by bacteria, and all cartoonish embellishments meant to deceive you.